Way-Way sent me this list of 100 Places to Take Your Kids today. It’s an interesting list, though I don’t think we will make it a point to try to make it through all 100. It seems to me that it is disproportionally weighted toward California. From the list, we’ve already been to El Yunque in Puerto Rico, which I agree was a great place for the kids. 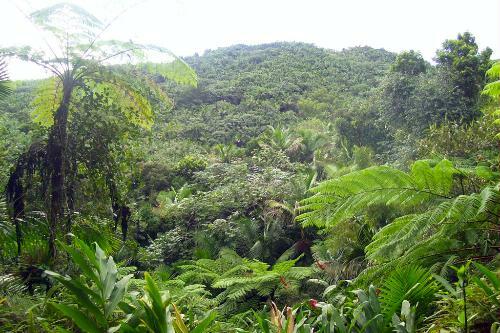 It’s the only tropical rain forest in the National Forest System and the trails and sights were fairly easy for the kids to manage, and how often are the kids going to be able to be in a waterfall? 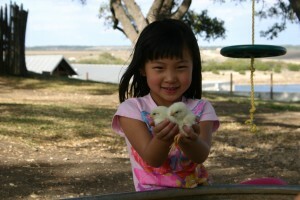 Dinosaur Valley is on the agenda for our next trip to Glen Rose. We had planned to go this year but ran out of time. It’s a good mix of fun and historical sites, but a few places that I’d like to add to this list are: the Experience Music Project Museum in Seattle, the Children’s Museum of Phoenix, and the National Zoo in Washington, D.C. I’m sure if I put some more thought to it, I could come up with a host of other places that deserve to be on the list as well. We are planning on hitting the road again and taking a short trip to Houston. This used to be a real bear of a drive, but now that they’ve increased the speed limit on I-45, it’s possible to make the trip in 3 and 1/2 hours. 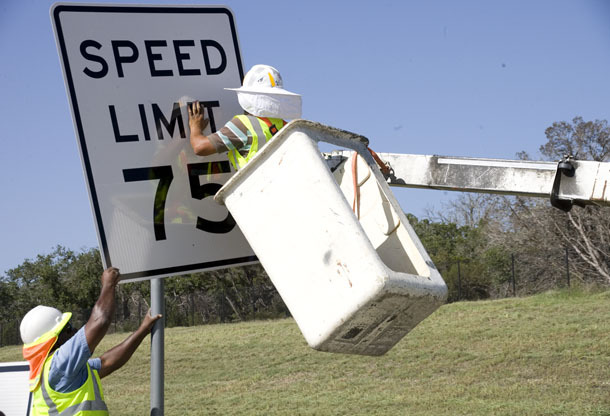 It’s exactly 250 miles from our house to my parents house on the northwest side of Houston, so we will have to average close to 70 mph to get there in that time, but as almost all of that mileage is on the highway, we should be able to do it, if we don’t have to stop. I know it’s possible because I did the drive myself a few weeks ago. This time, we’ll see if the kids cooperate. This year, like the years before, we visited Rough Creek Lodge over the Easter weekend and had a great time, as usual. Rough Creek is in Glen Rose, Texas and their pricing is all-inclusive — breakfast and dinner and lots of activities and amenities on site. We started the trip off Friday morning, leaving our house at about 11:30 and headed out on the open road. Several years ago, we got the kids these cheap portable DVD players — they are linked together so they have to watch the same thing and aren’t the top of the line in electronics, but they have survived bouncing around and being manhandled by my kiddos, which says a lot! Almost exactly an hour into the trip the kid’s got hungry for lunch. We were passing right through Burleson at the time and right in front of us was a sign for Babe’s Chicken Dinner House. If you’ve never been to Babe’s, it’s decent home style food. I think the original offered fried chicken or chicken fried steak, but most of their locations have expanded their menus to include fried catfish, smoked chicken, and chicken fingers. You order the entrée and they bring salad, sides, and biscuits until you tell them you’re full. 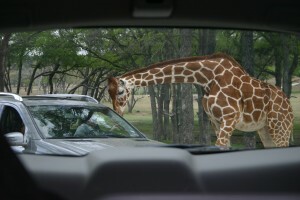 Usually, we try to hit Fossil Rim Wildlife Center straight away since the kids are already loaded up in the car and there’s no reason to lose momentum, but since we left a bit later today and with our dinner reservations a bit earlier, we went to the hotel instead. As we were pulling up to the hotel, I noticed that they had the pony rides going, so I told Way-Way that I would handle getting us checked in if she wanted to take the kids and let them go for a ride before they missed it for the day. Check in was a breeze. They booked us in a room with a queen bed, a twin bed, and a set of bunk beds — the kids definitely had fun with that. While I was getting us checked in and taking a look at the room, Claire and Gavin had finished their pony rides and were actually off to the next activity, which was a barrel ride around the parking lot. What fun! 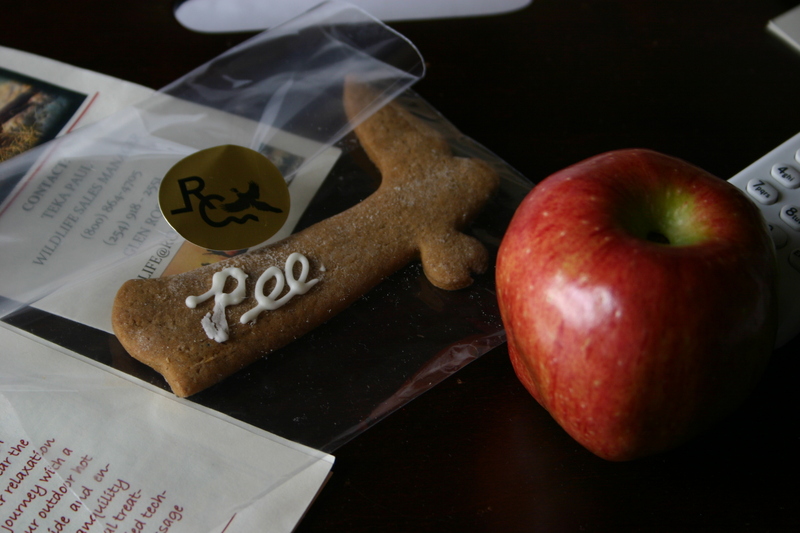 A personalized cookie and other goodies for us at check in. After the activities, we went back to the hotel room for a bit to relax and let the kids rest. I mentioned to them that they were going to go to a party while Mommy and Daddy went to dinner. It might have been a mistake because they immediately started complaining about having to go to the kids’ party. Oh the horror! I don’t want to watch a movie! I don’t want to play games and color! Well, the kids protested all the way until we went on a hayride and Claire made a friend on the ride and was now eager to go play with her at the kids’ party. 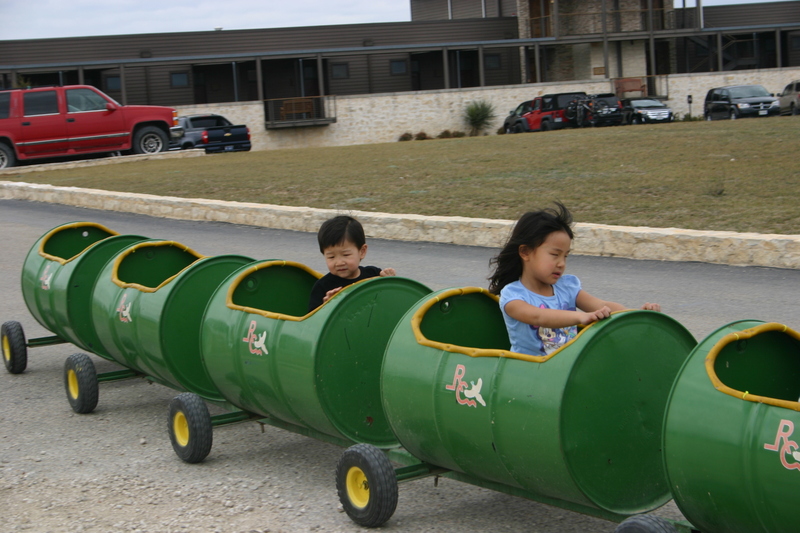 The kids really loved the hayride even though it was just a ride around the grounds there at the hotel. At the end of it, we dropped the kids off at the party and headed off to get ready for dinner. Dinner was amazing. I had a crab cocktail for an appetizer and Way-Way had mussels to start. They were both wonderful. Way-Way’s dish was accented with some house made salami, which was just perfect with the mussels. I had a rib eye steak for my main course and Way-Way continued on her seafood theme and had scallops, and again, both were great. Desserts were great as well — buttermilk pie for me and banana pudding for the missus. I couldn’t eat all of my food and had to take away 1/2 the steak, which the kids devoured later that night. The next day, everyone slept in until about 10am! The funniest thing is that the first thing that Gavin said as he got up was how much he loved the kids’ party! We managed to get up and about and over to breakfast before heading out for the day. Breakfast was buffet style, but very solid. Cereals, eggs, fruit, breakfast meats, migas, potatoes, various breads, biscuits and gravy, house smoked salmon and an omelet station, if I’m not forgetting anything. It would be a typical high end buffet that you might find at any 4 or 5 star hotel. After breakfast, we decorated some Easter eggs and cookies before heading out to Fossil Rim. 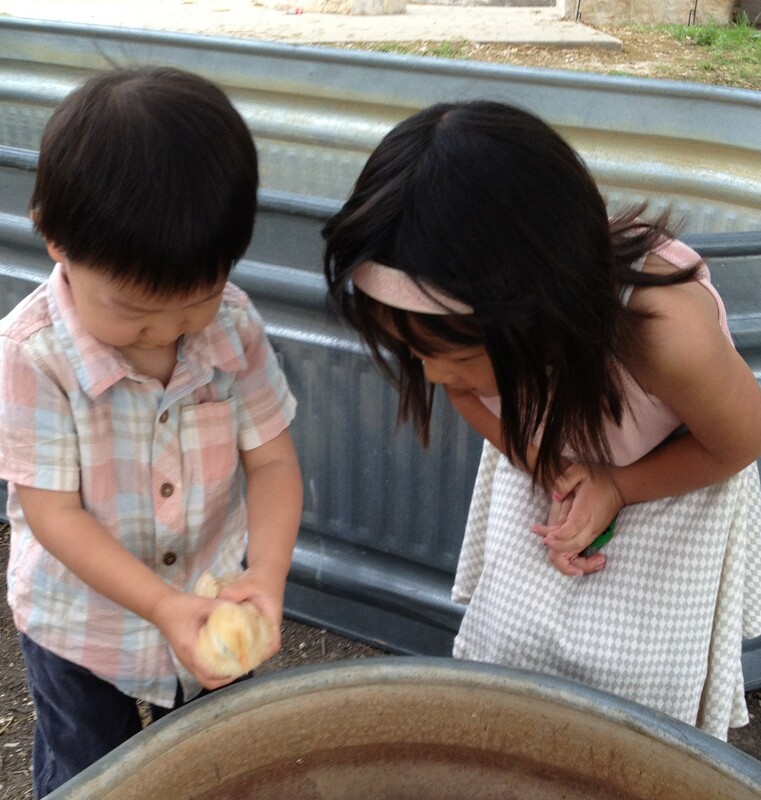 This year, the kid’s weren’t as captivated by the animals, but were still interested enough that it wasn’t worthless. We made it through pretty quickly and ended back at the hotel to pretty much repeat the activities from the previous day: pony ride, barrel ride, hayride, and kids’ party and dinner. This time around, Claire and Gavin were both super excited about the kids’ party. In fact, they were leading the way — we just couldn’t get there fast enough. When we went to go pick them up, they weren’t done playing and Way-Way and I waited around about 1/2 hour or more until they were ready to go. Sunday morning, the kids’ slept in again, and when they woke up, I sent them to answer the door. No one was actually at the door, but the Easter bunny had left baskets for them. They were obviously super excited to rip into their baskets to see what they got. After we got up and dressed, we were right on time for the Easter egg hunt that the hotel puts on. After the Easter egg hunt, the kids discovered that there were chicks and ducklings that they could play with, so we spent some time doing that and then headed over to brunch. Again, the brunch was fabulous — take their breakfast buffet and crank it up a couple of notches. In addition to the breakfast foods, they had a carving station with ham and beef, eggs benedict, salads, pastas, and an awesome dessert bar with cheesecake, chocolate cake, brownies, crème brulee, blueberry crumble, and homemade ice cream with a sundae bar. It was delicious and made for one sleepy car ride back home! A Pee family tradition started three years ago, kind of on a lark, as family traditions often do . . . I had been working for a company that always took Good Friday off, so I decided to make arrangements for a little family vacation. Of course, I waited and waited until the last minute, and then with little research found a place within driving distance that looked like it would fit the bill — Rough Creek Lodge — and we’ve been visiting every Easter since. Rough Creek Lodge is in Glen Rose, Texas — about 90 miles directly southwest of Dallas, or an easy 2 hour drive from where we live. That first year, I called the week of Easter and booked the very last room. I’m not sure what I would have done if they were booked since I didn’t have a Plan B ready, but it worked out for me. In Glen Rose, our routine is to hit Fossil Rim Wildlife Center which is basically a scenic drive through an open zoo where you get to feed the animals. They have all sorts of animals, but the kids get the biggest kick of feeding the giraffes, which will eat right out of your hand. We can usually finish the drive in less than 3 hours, which is just about perfect for a post-lunch outing for us. Back at Rough Creek, the Easter package includes dinner Friday and Saturday night, breakfast on Saturday and Sunday, and Easter brunch — and the food is fabulous. In addition, they have kid’s parties on Friday and Saturday night so the adults can have a nice dinner by themselves. In the past, we’ve had to hire a babysitter — their babysitters on staff are just great kids — since Gavin wasn’t quite potty trained, but not this year! Anyway, the food and service at Rough Creek are both exceptional — by themselves, they make the trip worth it, but we pack in a lot of other fun stuff at the resort and around town as well. We’ve done Dinosaur World in the past, which is just a park with lots of models of dinosaurs. This is one the kids definitely enjoy more than the adults. They have a sand pit where the kids can look for “fossils” which they seem to enjoy. This year, I’m thinking that Gavin is old enough for us to go on a little hike at Dinosaur Valley State Park instead. There are supposed to be fossilized footprints in the riverbeds and around the park. 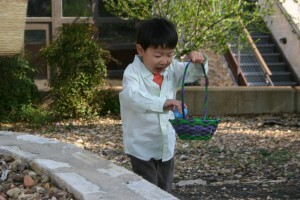 On Easter Sunday, Rough Creek traditionally does a great job making it festive for the kids. They have baskets waiting for them at the door, the Easter Bunny comes for a visit, and there is an egg hunt in the early afternoon. It’s definitely a great time for the whole family.